Is Apple Slowing Down Old iPhones on Purpose? Time to take out your tinfoil hats, everyone, because a new report released by a student at Harvard University certainly has the framework to build an interesting conspiracy theory. A Harvard University student named Laura Trucco recently gathered data that, if looked at in one way, seems to suggest Apple slows down its iPhones before the launch of a new product, in some sort of effort to force people to upgrade. The study is relatively simple. 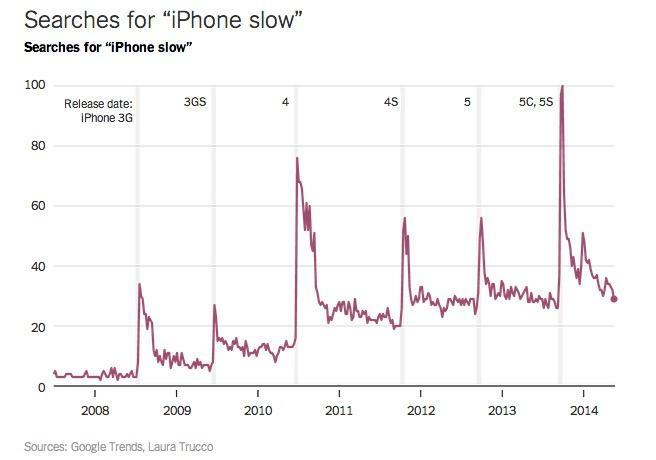 Trucco searched for when people searched most for “iPhone slow.” Her results show major spikes for that search term right around the time of the iPhone launch each year, according to Daily Mail. That might show that Apple somehow plans to make its products obsolete right when new ones launch, though we think there are also other explanations for why this happens. If the searches spike after Apple has released a new version of iOS, then that would show that perhaps the newer software just doesn’t run as well on older devices, which is typically the case — and the updates aren’t ever forced on anyone, but often do add enough features to make it worthwhile. Still, Trucco shows that the same conundrum doesn’t occur for new Galaxy devices, and one of her professors at Harvard thinks she may be on to something. “Yes, phones feel slower over time as they hold more software and as our expectations of speed increase,” Harvard economics professor Sendhil Mullainathan said in a New York Times article on Tuesday. “But the spikes show that the feeling doesn’t grow gradually; it comes on suddenly in the days after a new phone is released.” Mullainathan warns that the data simply shows “correlations, not conclusions” and that the data may show one of two things: benign data or a real conspiracy. The simpler answer, of course, is the point I mentioned above. “In the benign explanation, a slowdown of old phones is not a specific goal, but merely a side effect of optimizing the operating system for newer hardware,” Mullainathan explained. What do you think?